The boogie-man isn’t in my closet, he’s in my vineyard. Let me tell you what I have nightmares about. It’s not about monsters under my bed or the boogie man hiding in my closet or even the creepy animatronics from that one Disneyland ride (that was only once when I was 8). It’s gophers. These root-clippers were designed to obliterate grapevines. Their teeth literally never stop growing and have to be filed down on the roots of plants. They have extensive tunnel systems that protect them from flooding during the winter, are active year-round and can have up to three litters of up to 6 young per year. I’ve personally removed fully mature grapevines with pounds of fruit almost ready to be harvested because they had been entirely severed from their root-system. You can probably understand why I’m having nightmares about these little guys. They are such a prominent problem for agricultural industries that many different methods have evolved to deal with them. There are poisons, traps, gases and even propane-based explosives available to try and keep them in check. The problem I have with many of these methods is impact. Poisoning gophers can have unintended consequences; if a gopher eats some poison a hawk or gopher snake could eat the gopher and be poisoned itself in turn. Fumigation can kill beneficial organisms in your soil and I shudder to think what exploding gopher tunnels with propane would do to a vine’s roots. That’s why I’ve placed all my hope in the owls. A nesting pair of Barn Owls can consume up to 3,000 pounds of rodents in a four month period when raising young. They also are uniquely non-territorial and multiple pairs can nest within a relatively small area with no problem. 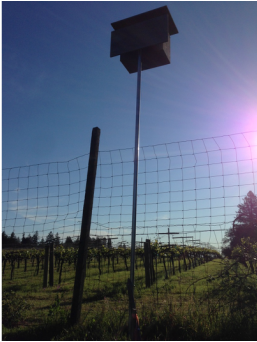 In order to attract some more owls to our vineyard we’ve put up owl boxes: boxes with a small, protected opening on a pole at the perimeter of the vineyard and we hope to have some new neighbors very soon. In this blog I’ve stated many times that we are committed to sustainability and environmentally responsible farming practices. We’ve definitely talked that talk and this is us trying to walk that walk. We’re starting small with owls and reduced water consumption but these are just the first steps on our path towards sustainability and hopefully just the first of many blog posts sharing the good news with everyone as we take those steps.